Keith Carradine and Harvey Keitel, two of the decade's most interesting actors, play French soldiers in conflict through much of the tumultuous Napoleonic era of French history. After roguish soldier Gabriel Feraud (Keitel) kills the nephew of the mayor of Strasbourg, Armand d'Hubert (Carradine) is tasked with bringing Feraud to justice. 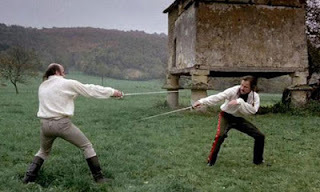 However, Feraud challenges Hubert to a duel, sparking a personal conflict that lasts decades. Over the years, the pair meet sometimes randomly, sometimes by design to duel and hopefully conclude their business. In between, we follow the actions of Hubert as he moves through the changing allegiances of the era. Eventually, post-Elba, the pair find themselves on the opposite sides of Napoleon's attempted return to rule before Waterloo. Their final duel of pistols — a quiet cat and mouse chase on an empty medieval ruin — is brilliantly crafted and reminiscent of the finales of Alien, Blade Runner and Black Rain. Like much of his less accessible works, the sheer beauty of his film is almost burdensome on the narrative. The Ridley Scott visual hallmarks are impossible to miss: dark interiors scenes lit through blown-out windows, textured and elaborate production design, candles, drapes, smoke and all sorts of cinematic atmosphere. Scott may have even started the modern trend of overusing close-ups, as much of the dialogue scenes feature actors like Keith Carradine speaking to Cristina Raines in extremely tight close-ups. Unfortunately, in between the half-dozen or so sword and pistol battles, the character drama never rises above robotic and inert drama. The casting is the most interesting aspect of the picture; Americans Keith Carradine and Harvey Keitel play their roles without any British accent inflection, now customary in period films. Keitel brings his remarkable intensity with little dialogue to deliver. And despite his notoriety with Scorsese pictures Mean Streets and Taxi Driver, the tough New Yorker fits the bill as an angry Jacobin, while the easygoing Carradine is amiable and sympathetic enough to root for as a hero. Both actors shine in the swordplay scene, which is the whole purpose of this film. The Shout Factory Blu-Ray sparkles, with special features that are comprehensive, audio commentaries by Mr. Scott and composer Howard Blake, a recent interview with Keith Carradine, and most interestingly, a one-on-one sit down discussion between directors Ridley Scott and Kevin Reynolds, a Duellists fan. Scott opens up about his process even more than usual with another director present, often riffing on the details cine-techies love, recalling production stories only fellow filmmakers share with one another. Thanks for the great list, gives me a lot of info on how to get mine up to speed!